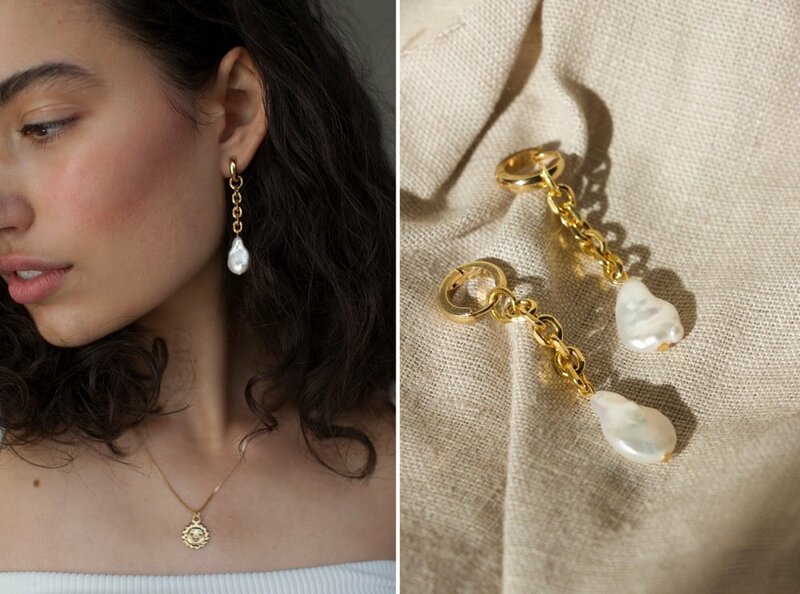 When you think of the words ‘timeless’ and ‘classic’ in the world of fashion accessories, there are few things that spring to mind more quickly than the pearl. Since nearly the beginning of accessories (we’re going to state this timeline as fact because it’s likely impossible to corroborate), women have been wearing these little wonders of the sea on their necks, ears, and heads. We have seen them as the key players of outfits on famous art pieces as well as the lobes of adored movie stars. There are fewer pieces as classic as the pearl. Since we’ve been rocking these sea-gems for eons, today it’s not a rarity to see them most often sported by our fashion icons of yesteryear — our grannies. Were she still alive today, I know my Mimi would still be waking up on a daily basis and adorning her favourite pair of pearl studs to accompany any outfit with flair. So for some of you, the association with this timeless piece could be a grandma. That’s where the magic of BRIE LEON steps in. She understands the history of the pearl, the timelessness of such an object, and she celebrates it. The way she’s designed and crafted her range of accessories, BRIE LEON as a brand recognises to the importance of core pieces that are easy to wear and are easily enveloped into the wearers own personal style identity. “Our ethos revolves around having a connection to each piece that we sell, and each person we sell to. We want pieces that are easy to travel with, can be worn with absolutely anything, that can transition from day to night. We want you to be able to live your full life in these pieces.”. Basically, these ain’t your Nana’s pearl earrings. But I can hear your pleas for help, now. But Ladies! I’m not a classic girl! My bridal look is anything but timeless! I’m going for BOLD, I’m going for STATEMENT EARRING, I’m going for WOWIE ZOWIE! …Well, for the record, if we had any pull in the vernacular that the wedding industry uses, we’d definitely vote ‘WOWIE ZOWIE’ in and vote ‘Rustic’ out, effective immediately. But girl, I hear you, and the magic of BRIE LEON does not stop too soon to still be your wedding best friend. Our girl BRIE stocks a myriad of pearl-less options in her wardrobe-staple-friendly collection. L-R: Small Swirl Hoops, Large Pebble Hoops. Since my introduction to Clueless in ‘95, I have been able to whole-heartedly get behind the hoop earring. It’s the jewellery choice that follows you from work to evening wear seamlessly, and makes a statement of confidence (so that you don’t always have to). BRIE LEON stocks classic and subtle hoops, alongside the bolder choices that look like a shell and demand the wow factor that they deserve. Or, for the every-girl who always forgets to accessorise (this is my category), the Solid Drop Sleepers are the kind of earring that do the trick on the daily all by themselves. If there’s a piece of jewellery I can put in and forget about, that make me look more adult than I actually am — sign me up. It’s part her ethos, part her product, and part heart eyes that bring us to stock BRIE LEON’s beautiful wares in our Mrs Fray Shop. We know that her accessories would suit perfectly as subtle, stunning statements alongside the timeless beauty of any of the gowns or slips we stock. But, we’re here for you, yeah? So we’re doing our best to pile our shelves with things that are not only enjoyable for you to have on a wedding day, but as far beyond that as possible. Since her M.O. is timeless staple style, BRIE LEON brings the perfect attitude to the Mrs Fray table, and beyond. Buy something for yourself for the day, for your ladies to say thank you, or for your wardrobe three years after you’ve already been matrimonied (not a word, but coining it now). She suits all scenarios, the BRIE LEON girl. And that’s an accessory we can get behind.